I, like many others across the country have been in total shock and mental disarray at the results from the election this past Tuesday. I’m not sure what to make of my fellow Americans voting for an outright racist, sexist, homophobic and xenophobic egomaniac and what that will mean for the United States and frankly the World. From the initial announcement of Donald Drumpf gaining the magic 270 electoral votes, I have been curious about the election data and eager to explore how my home state fared at the county level. I found a great visualization blog post from fellow useR, Julia Silge of her home state Utah which gave me ideas and starter code and county-level election data from Mike Kearny! # what is in here? I ended up not doing as much exploratory data analysis as intended. The data set is coded with FIPS numbers. FIPS state codes are numeric codes defined in U.S. Federal Information Processing Standard Publication to identify U.S. states. Connecticut FIPS codes start with 09 - so I grabbed those out from the entire data set to explore. 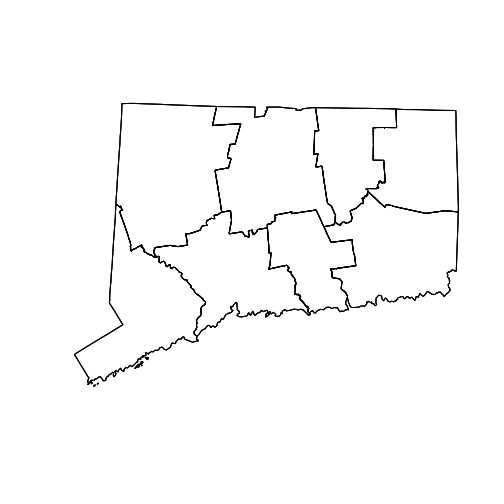 ##  "01001" "01003" "01005" "01007" "01009" "01011"
To make things more readable, I added the county names to the data.frame and since Connecticut only has 8 counties, I can complete this step in an iterative approach by matching up the fips numbers. ct_results$county[which(ct_results$fips %in% fairfield)] <- "Fairfield"
ct_results$county[which(ct_results$fips %in% hartford)] <- "Hartford"
ct_results$county[which(ct_results$fips %in% litchfield)] <- "Litchfield"
ct_results$county[which(ct_results$fips %in% middlesex)] <- "Middlesex"
ct_results$county[which(ct_results$fips %in% newhaven)] <- "New Haven"
ct_results$county[which(ct_results$fips %in% newlondon)] <- "New London"
ct_results$county[which(ct_results$fips %in% tolland)] <- "Tolland"
ct_results$county[which(ct_results$fips %in% windham)] <- "Windham"
Here is a bar chart using ggplot2 of the election results by candidate, votes and county. I may add to this section later! Shape files by county were downloaded with rgdal. ## Source: "/var/folders/nv/c92g05zj4tnbkwp_x6y9ly6w0000gn/T//RtmpDG6lwP", layer: "cb_2015_us_county_500k"
This election was fueled by discontent and ignorance of the “silent majority” around social and economic policies, so I thought it was worthwhile to gather some socio-economic data from https://datausa.io/ to enhance the election data. Data USA is a data viz tool that uses open public data from https://www.data.gov/ to share insights on occupations, industries and education. This data was web-scraped using rvest as the aggregated statistics by county are nestled in a web page. At this point, I merged the election data with the socio-economic data after picking which stats I wanted to capture and created seperate shapefiles for each candidate. ## let's try a specific candidates for creating shape files - Hillary Clinton!!! Spatial Analysis and mapping are a great way to visualize and understand this type of data, so I used leaflet for its interactivity to compare candidates and how many votes they received. This is the ground work for defining the color, popup info, and creating partitions for each candidate as their own base group on the map. # Populate statewide socio-economic values for popup! Here is our map widgets! Feel free to explore and adapt this code for your analysis of a given state!